The only reason you are reading this page is because you have a gap between who you are now a and the ideal personally you envisage. You want to learn and grow. Likely you have a combination of OE’s (Overexcitability). According to Dabrowski, most people don’t have this gap. Dabrowski (1960) defined The Gap as the cause of dynamisms. Dynamisms are negative feelings about the self e.g. shame, guilt, self-loathing, inner conflict, frustration. When they arise, they result in Gap-Energy, which is a driver for change. This is one of the main concepts within MERT (Multilevel Emotion Regulation Theory) developed by Simone de Hoogh that transforms our lives towards self-chosen goals. Every time we are aware that we are our ‘current self’, whilst envisioning our personality ideal ‘ideal self’ that we are not living up to, it creates a lot of negative feelings about ourselves. If we were not aware of this personality ideal we would have no drive whatsoever to learn and grow and we would never read this page. We would be just content with the way we are, the way we behave and interact with others. 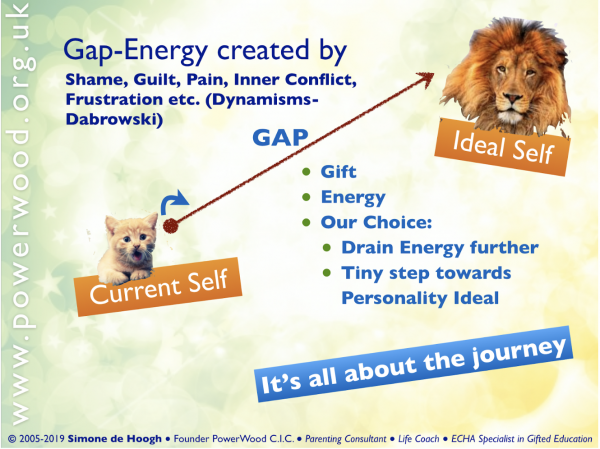 We see these feelings, those Dynamisms as our Gap-energy. This energy is a gift to us. We can use the energy either to pull ourselves down or lift ourselves up. When we pull down, we drain our energy further by creating an unhelpful train of thought, feelings or actions that ingrain unhelpful neurological pathways even further. When we grow, we use the energy for a tiny, tiny step towards our personality ideal, acknowledging that when we move up towards our personality ideal, our ideal personality will move up too. We will never get there, it is all about our journey. The following picture shows an overview of the gap dynamics and energy. Having the Gap is what makes us special. All the negative feelings about self are the energy that makes us want to improve ourselves, our relationships, and maybe even the world. One of the main issues with awareness is that as we become more aware of our behaviour, thoughts, feelings, often triggered with overwhelming reflections on ourselves and others that are mostly negative, e.g. 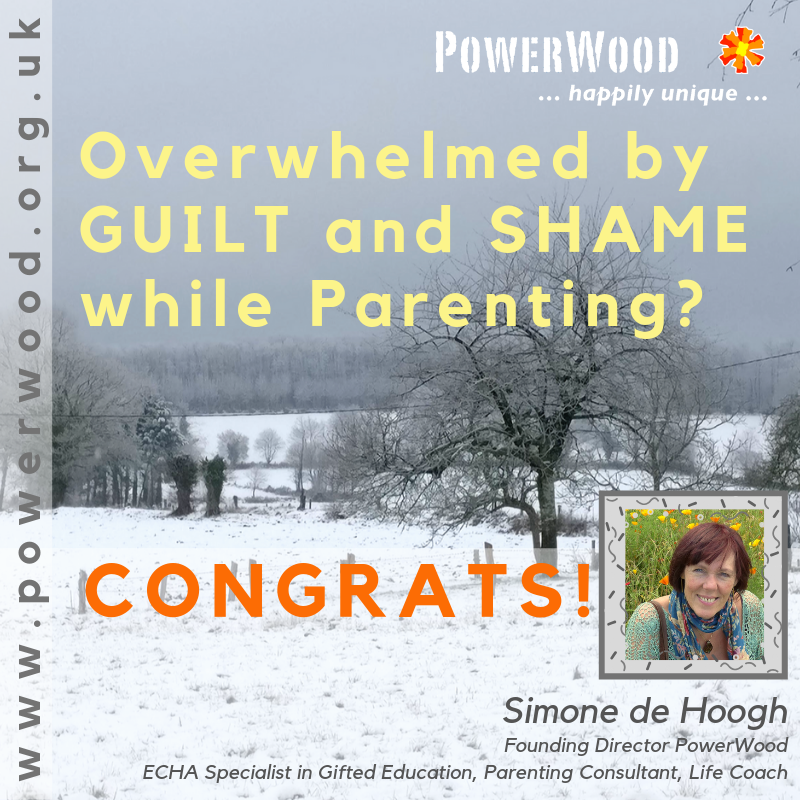 guilt, shame, anger, resentment, self-doubt, self-pity, inner conflict, sometimes even self-loathing etc. Having these unhelpful thoughts about ourselves or others is often the start of a hugely elaborate, bleak scenario, that often has been visited many many times before, as described in Sandra’s story at the start of this blog piece. Before we know it, we back off from growing awareness, to prevent us having uncomfortable feelings, and that stops our personal growth path. Our aim is to Raise Awareness without losing our calm. We are not able to change what we feel however we are able to change what we think and therefore influence how we are feeling. We use the Awareness Mantra, a tool to help ourselves be mindful and to strengthen our Baseline by raising our Emotional Resilience while being able to be with the uncomfortable feelings. We do this by catching whenever we are aware of a Gap-Energy associated thought, feeling or actions (can be an hour, a day, a week later, doesn’t matter when) and applying The Awareness Mantra: “I’m proud and grateful to be aware I have an unhelpful thought/ feeling/ action” and followed by something energy restoring e.g. do the 4-7-8 breathing technique to prevent any not helpful train of thoughts happening, draining our energy-level further and preventing any not helpful bleak scenario neurological pathway more deeply ingrained. Our level of energy and emotional resilience makes all the difference between being overwhelmed by our own emotional reactions or being able to stay calm and being able to think strategically and constructively to support our child or children, and modelling to our children how to focus on what we want to achieve, by raising our Baseline, preventing unhelpful thoughts drain our energy further etc. will enable our children to acquire these skills through osmosis. There are many Tools and strategies that we can use to strengthen our emotional resilience. Subscribe to PowerWood’s email newsletter (in the right-hand sidebar) and you will be the first to know when new posts are being published. This blog is not intended as diagnosis, assessment, or treatment, and should not replace consultation with your medical provider.